With a chef-driven, scratch kitchen, Chef Jonathan Calabrese adds a fresh perspective to your favorite Texas saloon. The Nodding Donkey remains the Best Sports Bar in Dallas located in Uptown, but we've made it even better. Owner/Chef Jonathan Calabrese curates an all-new menu, seriously expands our brunch offering, adds the freshest salads in Dallas and takes on some of Texas' best craft beers. The Nodding Donkey, State & Allen and Savory Catering have always been particular about using only the freshest local ingredients, and yet The Nodding Donkey's signature favorites remain such as our smoked wings, brisket tacos, and the best patio in Dallas. Join us for the the best brunch in Dallas, enjoy our patio, and rest assured that we've got the game on one of 20 big screen TV's. The Nodding Donkey - it's your neighborhood bar. blend of fire roasted anaheim peppers, cheddar cheese, brisket (smoked in-house), corn pico, jalapeños and chow-chow. crispy marinated chicken strips rolled in 9 herbs and spices. served with fresh-cut fries. crispy marinated chicken strips tossed in buffalo sauce. with fresh-cut fries. deep-fried, lightly battered pickle slices. we smoke ‘em in house then fry ‘em. you pick the sauce: bbq, spicy bbq, classic buffalo, lemon pepper or s&a buffalo. try our signature wings baked upon request. corn tortilla chips with our made-from-scratch fire-roasted salsa. fried oaxaca white cheddar with a hint of jalapeños. your choice of dipping sauce: marinara or ranch. chips, jalapeños, seasoned beef, lettuce, cheddar, queso and pico. our fresh-cut fries topped with queso, shredded cheddar, bacon and green onions. brisket queso, guacamole and salsa with chips. five of our most popular starters: buffalo wings, wagon wheels, donkey balls, s&a chicken strips and jalapeno skins. you pick 3 dipping sauces: marinara, ranch, red ranch, BBQ or honey mustard. 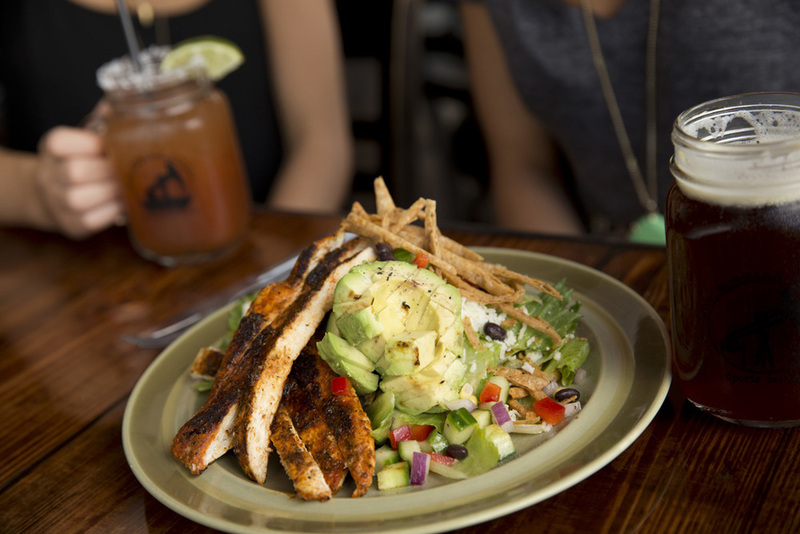 romaine, black beans, corn, cucumber, red bell peppers, shredded oaxaca cheese and onion aside a whole blackened chicken breast and avocado slices. served with tortilla strips. house smoked turkey, bacon, cranberry mayo, avocado, lettuce and swiss cheese on whole wheat toast. crispy chicken tossed in sweet cayenne sauce on a brioche bun. side of blue cheese dressing. slow-roasted molasses-infused pulled pork and tangy slaw on a brioche bun. house smoked brisket, homemade bbq sauce, bacon, pickled sweet jalapeños and cheddar on multi-grain bread. chicken sandwich w/avocado, pepper jack, lettuce, tomato and chipotle mayo served on a brioche bun. chicken breast, peppers, and onions melted under pepper jack cheese. your choice: chicken, brisket or pulled pork in oaxaca cheese in a luna’s tortilla. served with our housemade fire roasted salsa. three chicken and oaxaca cheese enchiladas topped with three different sauces: sour cream, queso and green chili. three brisket and oaxaca cheese enchiladas topped with ranchero sauce garnished with lettuce, pico and cotija cheese. grilled chicken smothered in bell peppers, smoked onions, and pepperjack cheese. three tacos with choice of meat: brisket, chicken or pulled pork. topped with pico, shredded lettuce and cotija cheese. served with our housemade fire roasted salsa. beef or chicken. served with grilled onions and bell peppers. side of guacamole, sour cream and cheddar cheese. served with our housemade fire roasted salsa. saturday & sunday 11am – 2pm. brunch items served with purple potato and bacon hash. two eggs over medium with ham, crispy onions and picante cheese sauce on a croissant. hickory smoked brisket, scrambled eggs, shredded cheddar and green chili sauce served in fresh corn tortillas. two eggs served your way with bacon and toast. two eggs your way with bacon, biscuits and sausage gravy. scrambled egg, mexican chorizo, refried black bean, pico and oaxaca cheese in a 12-inch wheat tortilla. two fried eggs over a halved biscuit with canadian bacon and tasso ham gravy. * = available in gluten free upon request. surcharge may apply. Looking for the best outdoor restaurants in Uptown? The community is fortunate enough to have many solid choices when you want to enjoy the great outdoors with your meal.